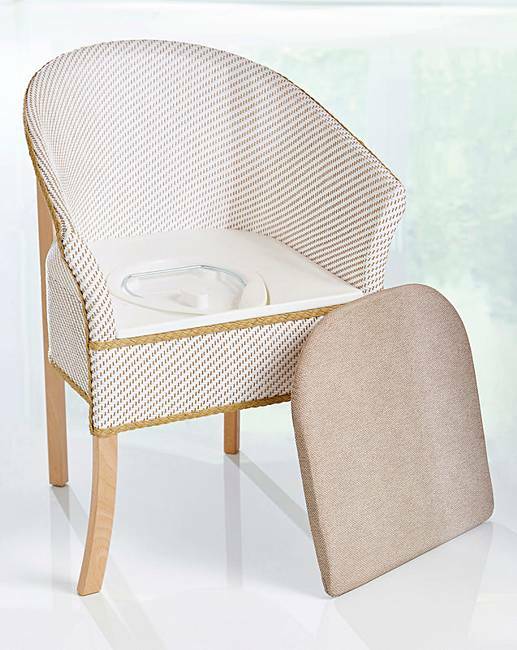 Deluxe Commode Chair is rated 4.4 out of 5 by 5. 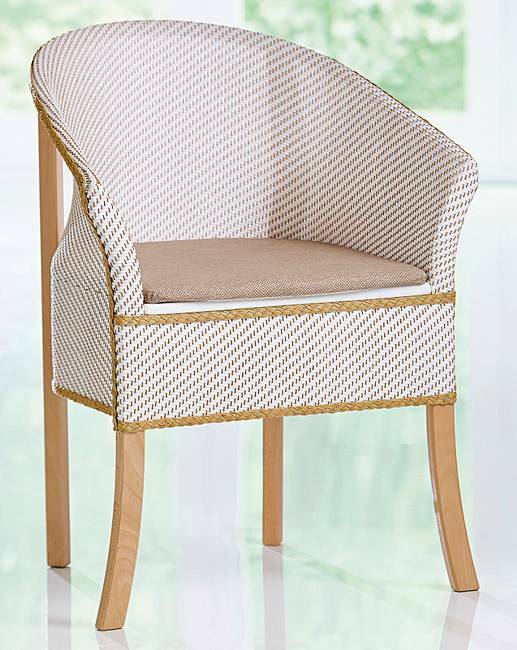 You'd never guess from its smart appearance but this beautiful basketweave armchair has a removable seat, disguising its commode function that's so reassuring for your bedside or living space. On a solid wooden frame, the elegant chair is fitted with a lift-out plastic container with both lid and handle for ease and hygiene. H: 30½ in x W: 17in x D: 17in. Seat height 18in. Rated 3 out of 5 by MelMc68 from On the whole, a decent product. I am in a situation where I need to rely on a commode. I had one from the hospital, but I decided to buy one that looks more in keeping with household furniture. So here is my review: As a chair, this fits well into the natural scheme. It is pretty generic, so will go with most decors. The actual seat is quite firm and the covering is plastic, so it can get warm and sweaty! I have had a padded cushion made to sit on top of the base. As a commode, it is ok, but could be better. For example, the pot is fairly shallow, so if you need to use it often, make sure you can get it emptied to match your needs! As I have Inflammatory Bowel Disease, I have to use this, as I don't have a downstairs loo... and I wish I did... but, as an alternative, it's ok. You do get condensation building up on the lid of the pot. Therefore, it builds up on the seat, which is quite disturbing if you don't dry the seat before use! But, on the whole, it does a decent job and serves its purpose. I just wish it was a bit deeper and didn't steam up as much! Rated 5 out of 5 by presto124 from Terrific when you need it! I bought this commode to use following major surgery on my foot and toes that I had just ten days ago. I had surgery on the same foot last autumn, and I knew from this that getting to the bathroom with crutches is a major "expedition" when one is recuperating from major surgery with heavy bandages and a surgical shoe. I also think this can also be dangerous particularly at night. In addition, it wakes you up completely. Also, when one must stay off one's feet as much as possible - again, this is a great item to have in one's room. That's why this time 'round, I bought this commode and it's super!! I was very happy to find it, the ones in hospital which I used following surgery are so institutionalised looking (which is understandable, of course) and nothing that I would want to have in my home. The commode itself is very easy to use and clean, with a simple, streamlined design for the commode part itself that works wonderfully. The chair is also a nice bit of furniture with an understated design that looks better in reality than in the photo here. This is such a great addition to your space if you are disabled, either temporary or I imagine in general. I buy a lot on line and I do not by any means write reviews all the time since I do not have the time. However, I am intent on writing this one as I think this is so valuable and well designed if needed. My husband agrees wholeheartedly with me and this review as well. Rated 5 out of 5 by Eto from Commode chair Exactly as described. Rated 4 out of 5 by Tigerpetal from would recommend this product I purchased this for elderly Aunt who was finding it difficult to get to the bathroom at night, this is much safer for her, it is very sturdy and looks nice in her room with a cushion on.